JAXA Arctic Extent as at 8 Feb 2018 13,241,477 km2, 116k less than 2017 on that date. A small extent loss of 9k km2, but 2017 had a small increase of 6k, while the average increase is about 25k. The cyclone is more or less over, but how long will its effect last? With 35 days (range 22 to 51), 0.55 million km2, and 7% of average extent gain to go, an average extent gain would result in a new record low of 13.80 million km2, 80k less than last year. But, cci-reanalyzer says a big warm-up over the next 10 days, there are unknown consequences of a possible big fat SSW, and the lingering effects of the cyclone are yet to come. Probably, average is going to be even more meaningless than usual. The 2017-18 freezing thread is going to be busy? --IJIS extent is projected to reach of a maximum of 13.67M km2 on March 16, an additional increase of 424k over the next 36 days, or 11.78k per day. --NSIDC extent is projected to reach of a maximum of 14.15M km2 on March 15, an additional increase of 407k over the next 34 days, or 11.97 per day. I'm not sure what you are saying. You are talking about the maximum, but in your calculation you only used the extent values for 16 March? How about years with an earlier or later maximum? The JAXA extent on 16 March is on average about 0.1 million km2 lower than the maximum. The post was in response to comments I'd seen speculating whether the freeze could be over. I wanted to show why that, while theoretically possible, it was highly unlikely. IJIS is back after its long weekend with a modest 22K gain for the three days to 13,263,605. With 2017 rising rapidly over the next week the next date where 2018 is likely to be challenged for lowest position is 7 days away on the 18th when 2016 drops to 13,547,054. However the required rise of 284K would still be well above the long term average for that week which is 150K. 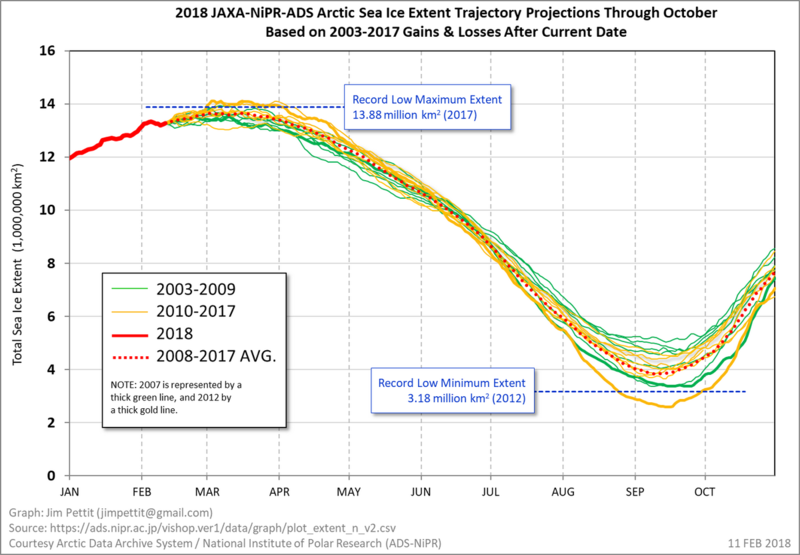 JAXA Arctic Extent as at 11 Feb 2018 13,263,605 km2, down to just 87k less than 2017 on that date. The last three days days have seen a net 22k gain, which is low. With 32 days (range 19 to 48), 0.52 million km2, and just 5% of average extent gain to go, average extent gain would end up with a new record low maximum of 13.78 million km2, just 100k less than 2017. But with the lingering aftereffects of the cyclone, unknown as yet impacts from the SSW, and entering the wobbly month of transition, who knows ? That method is biased low for estimating the maximum. By taking the average trajectory over the past 10 years, you get an unrealistically smooth trajectory, which remains basically flat during mid-March. In reality, the trajectories for individual years fluctuate much more. You only need a brief upward fluctuation to increase the maximum for a given year. To get a corrected estimate for the 2018 JAXA extent maximum using that method, you would have to add about 0.1 million km2 to your calculated numbers. For the NSIDC one-day extent maximum, the correction would be about 0.15 million km2. I think you need to have watched that particular graph for a few years. It isn't artificially anything. It this just a report. A report I pay a lot of attention to. As always, should you (or anyone else) care to create the same type of graphic and arbitrarily add 100k to the JAXA chart and 150k to the NSIDC one, I claim no ownership of the data, and I'm sure it would be of interest. Over the past couple of years, these projections have allowed me to be fairly accurate when projecting on maximum extent (though slightly less so on the minimum), so I'd like to see something else even more accurate. Good point. The chance of hitting a given maximum goes up with higher volatility, even when the average trajectory remains the same. I do find Jim's graph quite useful in any case. You don't have to use the average, instead you could guesstimate the maximum using the spread of individual years. JAXA extent 12th Feb 13,268,427 km2, 129 k less than 2017, up by just 4.8K km2. In 2018 extent has been less than 2017 36 days out of 43. Even more, the 2018 JAXA extent is the lowest of any year for those 36 days. For many of them, but not all, 2017 is now in second place. Here's an interesting statistical tidbit: today 2017 has 37 daily lowest extent records, and 2018 has 36. Tomorrow that will exactly reverse. 2018 will have 37 and 2017 will have 36. I'm going out on a limb a bit making this prediction. JAXA extent could have a double century rise today and embarrass me. Still, to torture a metaphor, it's a limb of ironwood with a two foot diameter, and I'm a sugar ant. We'll see tomorrow, which I boldly predict will begin with the sun rising in the east. "The sun rises in the east". I was on a plane and saw the sun rise in the west. Weird. Wait, what? Yes, OT, but how did that work? Were you flying faster than the sun? (OK, faster than the apparent speed of the sun. Damned physicists.) At the equator that would be 1000 mph or thereabouts, but at higher latitudes would be less, so feasible I guess. Or maybe you actually flew across the north pole, as some U.S. to Europe routes do? JAXA Arctic Extent as at 13 Feb 2018 13,300,888 km2, now 136k less than 2017 on that date. Extent gain on 13th of 32k, which is above average for that date. With 30 days (range 17 to 46), 0.47 million km2, and just 4.7% of average extent gain to go, average extent gain would end up with a new record low maximum of 13.77 million km2, just 110k less than 2017. 7 out of 10 of the previous 10 years say yes to a record low. The simpler way to have a sunrise in the west involves a funicular railway, a sunset, and absolutely perfect timing. Managed that one in Montecatini on honeymoon. We had one sunset just as we got to the station at the bottom of the funicular, then a sunrise on the way up, followed by another sunset after we got to the top. Coming back down later that night was equally spectacular for different reasons. There's a point where the line goes through a deep cut with overhanging trees and you can't see much - then you emerge from the gloom, and FOOM... the whole of Tuscany appears, jewelled with lights. 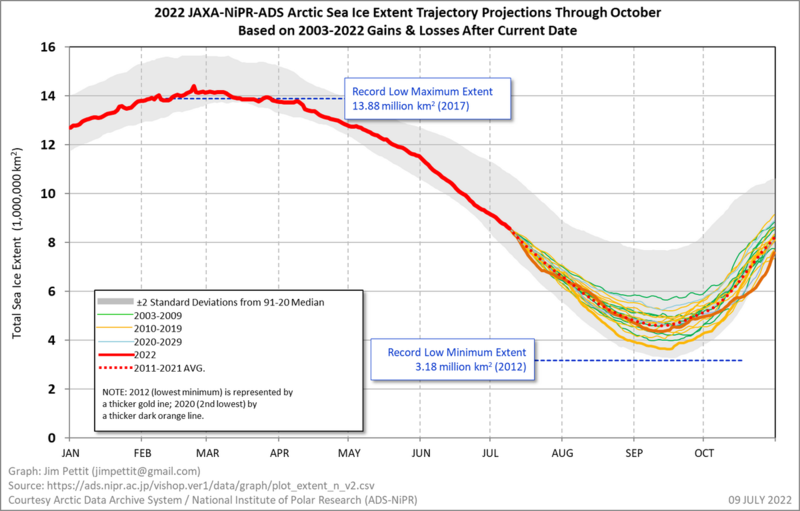 JAXA Arctic Extent as at 14 Feb 2018 13,342,060 km2, now 205k less than 2017 on that date despite a 41 k increase. With 29 days (range 16 to 45), 0.43 million km2, and just 4.3% of average extent gain to go, average extent gain would end up with a new record low maximum of 13.78 million km2, just 100k less than 2017. 7 out of 10 of the previous 10 years say yes to a record low. Extent gain on 13th of 32k, which is above average for that date. Lingering after-effects of the cyclone, unknown as yet impacts from the SSW, and entering the wobbly month or two of transition, who knows ? Gerontocrat, thank you for your daily updates and analysis on this and other threads. I want to add this chart from Wipneus' regional AMSR2 extent page, which explains a whole lot about the 2018 record low, and provides a lot to worry about for the coming melting season. Unprecedented is too easy a word for this. Unprecedented it is - I just add here Feb 14 vs Feb 6. A sense of foreboding about the coming melt season. When the Arctic Ice decides to go I don't think time of year is going to matter all that much. We won't know until afterwards when it happens, but right now things taste bad. Has 2018 decided to go its own way? Cor blimey. Stunning graph. Game changer ? Time to think aout what happens in the spring and summer? GFS and EURO are both in agreement over a major heatwave and/or LP event for Greenland + Arctic D8-10. Relevant to most recent replies, models show a continued wave of 960-980mb LPS buffering the Bering with sustained southerly winds and waves. It seems the Bering front should continue to retreat following the losses from 2/6-14 as depicted above. Perhaps substantially so. cci-reanalyzer this morning has the maximum anomaly on 21 Feb, and by the 25th Arctic temperatures much closer to average. JAXA Arctic Extent as at 15 Feb 2018 13,346,013 km2, just 4k up on the day, now 328k less than 2017 and 275k less than 2016 on that date. Given average extent gain of about 15k per day from now to maximum, 2018 extent is about 2 weeks below 2017 extent. 28 days (range 15 to 44), 0.39 million km2, and just 3.9% of average extent gain to go., Average result a record low maximum of 13.74 million km2, 140k less than 2017. 7 out of 10 of the previous 10 years say yes to a record low. For a few days until about 21-22 February Arctic temperature anomalies should be high, especially at the Bering and Atlantic ends of the CAB. Until then 2018 should continue to plough its lonely furrow. (In 2018, 39 days out of 46 lowest in the satellite record). After the 22nd Feb, Arctic temperatures may drop like a stone, or maybe not. Entering the wobbly month or two of transition, who knows ? JAXA Arctic Extent as at 16 Feb 2018 13,361,998 km2, an average 16k up on the day, now 347k less than 2017 and 305k less than 2016 on that date. Given average extent gain of about 15k per day from now to maximum, 2018 extent is about 3 weeks below 2017 extent. 27 days (range 14*** to 43), 0.36 million km2, and just 3.6% of average extent gain to go., Average result a record low maximum of 13.72 million km2, 160k less than 2017. (maybe my guess in the Jan poll of 13.5 t5o 13.75 will be correct ?*!??). 7 out of 10 of the previous 10 years say yes to a record low. *** In 2015 maximum was reached on 15th Feb, ridiculously early, and then for weeks there was almost no change in extent, i.e. significant melting did not start early. For a few days until about 21-22 February Arctic temperature anomalies should be high, especially at the Bering and Atlantic ends of the CAB. (The last graph contrasts The Bering Sea, where temperatures have been high, with the Okhotsk Sea next door, which has been cold most of the time). Until then 2018 should continue to plough its lonely furrow. (In 2018, 40 days (in the wilderness - Lent began on 14th February) out of 47 lowest in the satellite record). What really concerns me is how late the freeze occurred on the Pacific side. The Beaufort, Chukchi, Bering and ESS all struggled to freeze over. This meant these seas had far less time to thicken and, given the ridiculous warm anomalies on the Pacific side this winter, we have dangerously thin ice heading into this melt season. ^ This is certainly not going to help. .... + 6.7 C in the arctic!!? 1. How is it even possible to have ice in the arctic at the end of this coming melt season with anomalies like that during the refreeze period? 2. What happens if these temperature anomalies keep up for the rest of the year? 3. How much sea level rise are we going to see if we get 7C anomalies for the rest of the year? Sea level rise is a very slow process. Arctic temp anomalies for this freeze season have no impact. I'm sorry, but you're just 100% wrong. No impact? Where do people like you get your information? Impact yes, large no. The loss of floating ice has no impact on sea level promptly. It has secondary impacts that feed back loops that will contribute. Agree - it's not extent or area, its volume I'm worried about. Extent is a secondary problem, and for all of our new min-maxes happening, the effect of that difference is trivial compared to the last 3 years. The heat provided by open water will not be significantly greater. I was given to understand that the negative feedback was all about additions to ocean heat during the insolation season, year after year after year. After all, there are about 2 million km2 of open water today on the fringes of the Arctic where in 1979 there was ice. If a simple average is used, say about 1 million sq kms that has been absorbing most radiation instead of reflecting most radiation for nearly 40 years. Perhaps extent may not matter so much for an individual melting season, but surely it matters for long-term heating of the biosphere? Depends on the size of the floating ice, and where it floats to. If it's an Antarctic floater, a really big one, it can melt fast if it floats Northwards, and it will give a measurable SLR result worldwide. However my point isn't about those feedbacks directly. Rather it's about the difference in those feedbacks year over year. The point I'm making is the current difference in additional open water this season vis-a-vis the last 5 doesn't significantly change that equation. If the ice did not start off grounded, its displacement as ice will match its displacement as water. It's best not to extrapolate from.extreme events to a whole year. Also if you take a look at the DMI "North of 80o" chart, spring/summer anomalies in recent years are much closer to zero, from around day 120 to day 220, regardless of winter anomalies. And in general, such discussions belong in the freezing/melting season threads. About SLR and wintertime arctic anomalies, it' s best to refer to the Greenland melt thread, but certainly the effect isn't very strong. I also recommend using better decorum in forum posts. As the ice cover is lost and the arctic warms most of the sea level rise will likely come from warmer ocean water and thermal expansion of the water... should it not be? Of course insolation matters. Due to the very thin ice, the Pacific side of the Arctic is going to melt out very early allowing the sun to heat the water for a longer time. Let's hope for a cloudy summer. This is going to be a long post, because I'm going to share my thoughts on the subject, so I'll break it into numbered sections for simplicity of responding. 1. The main issue is that this temperature anomaly is going to worsen an already low ice thickness in the arctic. It's not about extent, its about thickness. The winter season helps to maintain thickness throughout the year so that in summer months thickness is maintained sufficiently that the ice which has been there for hundreds of thousands and millions of years (I believe the last time we had no ice in the arctic was several million years ago) of years is not lost. This balance is in the process of being lost, and 7C temperature anomalies almost ensure that ice thickness will be record low this summer. 2. THE PROBLEM IS NOT JUST THIS ONE ANOMALY but that we've been consistently at least 2 -4C above baseline all winter (maybe someone can correct me I dont have the data in front of me)- I don't have the data in front of me, but I've been watching it often enough to notice that 2017-2018 has been impressive in the persistence of arctic temperature anomalies . 3. we're currently at the lowest winter ice thickness and extent in thousands if not hundreds of thousands (perhaps multi millions) of years. 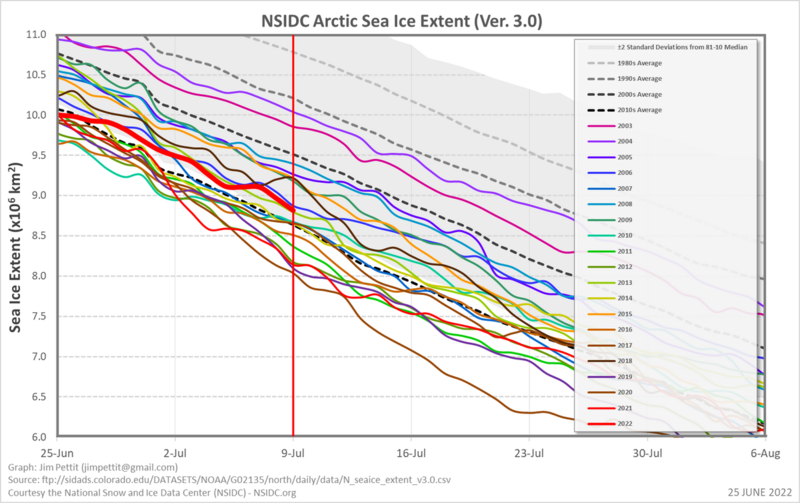 This means that there will be even lower ice extent in the summer and its possible that we will have a repeat of 2012, but this time with much thinner sea ice. As a result, I would imagine it's likely to have almost no ice in the arctic this summer. 4. As a result, and because the temperature anomalies are higher than they've been in hundreds of thousands if not millions of years, I would anticipate run away melting of the Greenland ice sheets. This is in addition to having almost no sea ice. 7C temperature anomaly is not just a "wow that's big" it's a "wow that's extinction material". The current rate of temperature increase over the past 150-250 years is far faster than the Permian, which took thousands of years to reach something like 12C. 5. Lower albedo effects in the summer months due to a lack of sea ice combined with methane release, CO2 release, and warmer sea temperatures will all feed back on each-other and produce remarkably warm conditions in the arctic this year, and EVERY SINGLE YEAR IN THE FUTURE. This is not just a one time event, this is the new normal, and it's only going to get worse in an exponential fashion. Unless of course something is done to lower arctic temperatures back to baseline levels immediately. 6. This is going to be a very difficult year for the apes of planet earth, and I would imagine that the next 2-5 years, at this rate, will not be survivable for most of them. 7. Already, temperatures in the northern hemisphere in many locations are 10-30 degrees above where they should be and its affecting agriculture. I can only imagine what's going to happen if there's no ice in the arctic this summer (or within the next 5 years almost certainly) and positive feedback loops take over. 8. The US only has a few months supply of grains to feed its population, and many countries has ZERO reserves. Multiple billions do not have more than 7 days worth of edible food stored, the rest have less than 30 days, and only a very small fraction have more than 30 days worth of edible food stored. Billions of apes rely upon agriculture to function almost perfectly each year, and if for any reason even 25-50% of that agriculture is unable to be harvested there will be famines of epic proportions that will activate positive feedback loops in the fragility of civilization that will cause even more deaths and more chaos. 9. Once positive feedback loops in the climate combine with positive feedback loops in the fragility of civilization, the combined effect will be exponential and difficult to comprehend. A good example of the positive feedback loops in the fragility of civilization is what happened in 2008 - one bank collapsed, which lead to more and more banks collapsing until everything collapsed - this is going to happen again, and this time it's going to happen at the same time that positive feedback loops in the arctic are ALSO taking place. 10. If societal situations spiral out of control and economic slowdown occurs, you trigger the removal of global dimming which increases worldwide temperatures by something like .5-3C within 1 month or so. What this means is that GLOBAL DIMMING will be removed when civilization is unable to function and the economy begins to slow down - the slower the economy, the higher temperatures get as aerosols fall out from the atmosphere. This will just make things exponentially worse because this process only takes a few months at most, as most of the aerosols are removed from rain events. The loss of global dimming due to an economic slowdown would increase global average temperatures no less than .5C within a few months. I've read figures as large as 3C within a few months. In short, positive feedback loops = extinction of large apes worldwide within a relatively short period of time of this message, IF nothing is done immediately to lower temperatures of the arctic. The temperature anomaly in the Arctic is impressive but not unusual and only for a few days. The signals are for a record low maximum extent but is not guaranteed. Record low winter volume last winter and spring did not lead to record low summer extent or volume. The recession following the financial crisis of 2007-8 did not result in aerosols disappearing. I am sure that as the next 10, 20 (?) 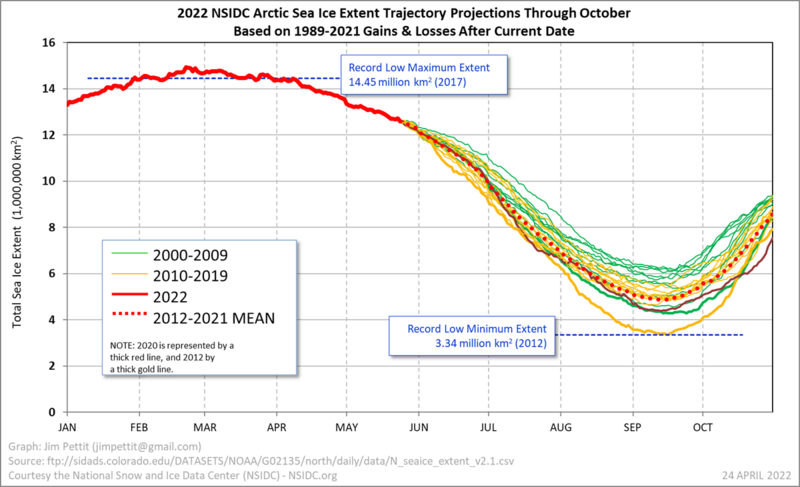 years go by the rate of change will accelerate but my next post will be on 2018 sea ice area and extent data. Again, please move non ice related discussion to a Consequences thread. Harpy, I will respectfully disagree. First, we have no data that the current ice thickness is the lowest in thousands of years. There is also significant debate as to whether today’s temperatures are the highest in this interglacial, not to mention most paleo data shows the last interglacial was warmer. Your claim about the last time the Arctic was ice-free is also unsupported. The summer albedo is determined by area, not thickness. There is only a slight albedo difference with thick ice compared to thin, while the difference between thin ice and open water is quite large. The other explanation for the lack of declining summer sea ice is the increased cloudiness. This has a similar strong albedo effect. Not sure where you are getting your astronomically huge temperature anomalies, but snow cover has not changed appreciably. Your claims if agricultural collapse seem he contradicted by increasing crop yields. World hunger has decreased appreciably over the previous decades. Do you really believe that we will not survive the next five years? Harpy, I will respectfully disagree. I can not move comments to appropriate threads with the click of a button, and even if I could, it would be time-consuming, so I'm going to ask you to stay on topic, or else I will remove comments. There has been a lot of excitement about an early end to the freezing season, but I could not see much correlation between the date of end of season and a low maximum. Is there a correlation between the number of days in a freezing season and the amount of extent gain in that year ? Is there a correlation between the number of days in a melting season and the amount of extent loss in that year ? After a bit of a tussle with Excel and a raid into one of the very old and rusty filing cabinets that pass for the memory in my brain,I came up with a result. The answer is, not really. The correlation coefficients are really low. Graphs attached. So forget about the date of the maximum, it is the value of that maximum that matters.